A recent conversation on my Google+ page generated a very interesting point of view from one commenter who was scandalized by divorced Catholics being denied the Eucharist while murderers were allowed to still approach for Holy Communion. That certainly seems scandalous doesn't it? Is divorce worse than murder that divorced Catholics need be punished even when murderers are forgiven? It's seem harsh, unforgiving, and downright unfair (especially to those who don't believe divorce is bad in the first place). As many Catholics might struggle with a similar understanding, I thought it might be worthwhile to look a little more closely at this apparent paradox in the way the Church treats murderers and divorced Catholics. However, the Church also notes the difference between a spouse who freely chooses to divorce and a spouse who is abandoned. Both are technically divorced (thanks to unfortunate "no-fault" divorce laws which make marriage the easiest of all contracts to break), but both are not morally at fault. The abandoned spouse has been sinned against, but has not himself "contravened the moral law.5"
The spouse who does the abandoning, or both spouses in the case of a "mutual" divorce, however are guilty of contravening the moral law and, under normal conditions6, have sinned mortally. 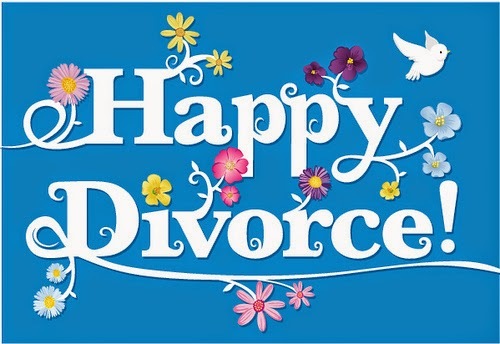 Divorce, then, is serious business, but so is murder and murderers can be forgiven. Is divorce the only unforgivable crime? There is an all too common misconception among Catholics that divorced Catholics are barred from Communion, such simply isn't the case. As we saw above some divorced Catholics are the victims of divorce and are not morally culpable for their divorces. Even among those Catholics who have "contravened the moral law" by freely choosing to divorce their spouses are not treated any differently than other Catholics in a state of mortal sin. A simple trip to the confessional, with true contrition of heart for the divorce, is all that is required to bring the morally culpable divorced Catholic back into communion with the Church. 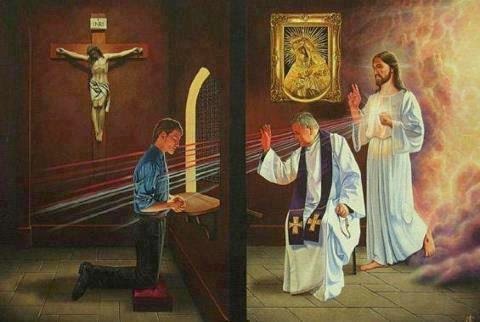 A Catholic thus forgiven can receive the Holy Eucharist each week, even every day if he attends daily Mass. In this way, the divorced Catholic is treated no more harshly than a murderer or any other person in a state of mortal sin. All the Church asks of any of her children who fall into mortal sin (which, if we are being honest, is all of us at one time or another) is to repent of our sin and seek Christ's forgiveness through the ministry of the Church. When Catholics talk about "divorced Catholics" they frequently mean "divorced and remarried Catholics." These Catholics are in a more difficult situation than those Catholics who are civilly divorced, but have remained single. The distinction becomes clear when we remember that the civilly divorced are still actually married to their first spouse. The civil divorce creates a legal situation that might be advantageous (and even tolerable to the Church) for the spouses, but they are still married. Not just still married "in the eyes of the Church" or even "in the eyes of God," but actually just as married as they were the day before they civilly divorced on their wedding night. These "remarried" Catholics are not, then, remarried at all. We can only be actually married to one person at a time, any subsequent "marriage" is no real marriage at all. That doesn't mean that children of these pseudo-marriages are illegitimate (legitimacy being a legal recognition conferred by the laws of the State) or that real love and affection can't exist in these relationships, but, regardless of how loving they might otherwise be, marriages they are not. This leads to the unfortunate situation of a civilly divorced and "remarried" Catholic being married to their first spouse but living with (and having sexual relations with) another person. The civil divorce and civil remarriage mean nothing morally here. This is a clear case of adultery, which is another mortal sin on top of the divorce. Which, if it were a one time event, would still not lead to a permanent ban on receiving Our Lord in Communion as adultery can also be forgiven in sacramental Confession. But forgiveness can't be granted to those who are not sorry for their sins or for those who do not seek to amend their lives, to "go and sin no more.7" Divorced and remarried Catholics are precisely those who refuse to repent of their sin of having sexual relations with someone other than their validly married spouse and thus cannot be forgiven. Divorced and remarried Catholics who either separate or, for the good of any children they have together, continue living together but resolve to permanently refrain from the marital act (and indeed from other signs of married life that would naturally lead to sin, such as sharing a bed) and who sincerely repent in sacramental Confession can be readmitted to the Sacramental life of the Church, including Holy Communion. The difference in the Church's treatment of a Catholic murderer and a divorce and remarried Catholic then isn't so surprising. The Church, following the example of Christ, is willing to forgive any sin so long as the sinner is willing to "go and sin no more" and is unable to forgive any sin which the sinner either refuses to recognize as a sin or refuses to make a firm amendment to stop committing. A divorced and remarried Catholic who intends to go on committing "public and permanent adultery8" is not at all like a repentant murderer, but is more like a serial killer who fully intends to continue to kill innocent people. The Church simply lacks the ability to forgive anyone who isn't sorry for their sins. 6 - Is Divorce and Remarriage Worse than Murder? Looking at sins and wondering which is "worse" than which is ultimately an act of futility. Their are mortal sins and venal sins. The "least bad" mortal sin is enough, if left unrepented, to damn a soul to an eternity of hellfire. While "public and permanent adultery9" is not as bad as murder it can be more lethal to the sinner. As our culture lauds divorce and remarriage, calling that which is evil good and good evil,10 many more souls are likely put at risk though divorce and remarriage than are jeopardized by murder (which everyone still recognizes as evil). In this sense we can say the likely results of divorce and remarriage are "worse than" the likely results of murder. At the same time, murder is, objectively considered, a greater moral evil than adultery as it is worse to steal someone's life than it is to steal his wife. It's always interesting to read about any topic from different points of view. I completely agree with these ideals. However, understanding how far our culture has gone, the question is how can we change the entire culture back? You can't change the minds of everyone in our society. In case you need to find out the average divorce cost, you may click here to investigate. Where Do You Get Your Catholic News From? Does Lack of Evidence for God Justify Atheism?